The Christian Science Monitor (CSM) is a nonprofit news organization that publishes daily articles in electronic format as well as a weekly print edition. It was founded in 1908 as a daily newspaper by Mary Baker Eddy, the founder of the Church of Christ, Scientist. As of 2011[update], the print circulation was 75,052. According to the organization's website, "the Monitor's global approach is reflected in how Mary Baker Eddy described its object as 'To injure no man, but to bless all mankind.' The aim is to embrace the human family, shedding light with the conviction that understanding the world's problems and possibilities moves us towards solutions." 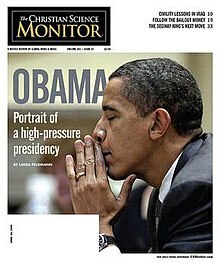 The Christian Science Monitor has won seven Pulitzer Prizes and more than a dozen Overseas Press Club awards." Despite its name, the Monitor is not a religious-themed paper, and does not promote the doctrine of its patron church. However, at its founder Eddy's request, a daily religious article has appeared in every issue of the Monitor. The paper has been known for avoiding sensationalism, producing a "distinctive brand of nonhysterical journalism". In 1997, the Washington Report on Middle East Affairs, a publication critical of United States policy in the Middle East, praised the Monitor for its objective and informative coverage of Islam and the Middle East. In 2006, Jill Carroll, a freelance reporter for the Monitor, was kidnapped in Baghdad, and released safely after 82 days. Although Carroll was initially a freelancer, the paper worked tirelessly for her release, even hiring her as a staff writer shortly after her abduction to ensure that she had financial benefits, according to Bergenheim. Beginning in August 2006, the Monitor published an account of Carroll's kidnapping and subsequent release, with first-person reporting from Carroll and others involved. The paper's overall circulation has ranged widely, from a peak of over 223,000 in 1970, to just under 56,000 shortly before the suspension of the daily print edition in 2009. Partially in response to declining circulation and the struggle to earn a profit, the church's directors and the manager of the Christian Science Publishing Society were purportedly forced to plan cutbacks and closures (later denied), which led in 1989 to the mass protest resignations by its chief editor Kay Fanning (an ASNE president and former editor of the Anchorage Daily News), managing editor David Anable, associate editor David Winder, and several other newsroom staff. These developments also presaged administrative moves to scale back the print newspaper in favor of expansions into radio, a magazine, shortwave broadcasting, and television. Expenses, however, rapidly outpaced revenues, contradicting predictions by church directors. On the brink of bankruptcy, the board was forced to close the broadcast programs in 1992. The Monitor's inception was, in part, a response by its founder Mary Baker Eddy to the journalism of her day, which relentlessly covered the sensations and scandals surrounding her new religion with varying degrees of accuracy. In addition, Joseph Pulitzer's New York World was consistently critical of Eddy, and this, along with a derogatory article in McClure's, furthered Eddy's decision to found her own media outlet. Eddy also required the inclusion of "Christian Science" in the paper's name, over initial opposition by some of her advisors who thought the religious reference might repel a secular audience. Looking over the newspapers of the day, one naturally reflects that it is dangerous to live, so loaded with disease seems the very air. These descriptions carry fears to many minds, to be depicted in some future time upon the body. A periodical of our own will counteract to some extent this public nuisance; for through our paper, at the price at which we shall issue it, we shall be able to reach many homes with healing, purifying thought. Eddy declared that the Monitor's mission should be "to injure no man, but to bless all mankind". MonitoRadio was a radio service produced by the Church of Christ, Scientist between 1984 and 1997. It featured several one-hour news broadcasts a day, as well as top of the hour news bulletins. The service was widely heard on public radio stations throughout the United States. The Monitor later launched an international broadcast over shortwave radio, called the World Service of the Christian Science Monitor. Weekdays were news-led, but weekend schedules were exclusively dedicated to religious programming. That service ceased operations on June 28, 1997. In 1986, the Monitor started producing a current affairs television series, The Christian Science Monitor Reports, which was distributed via syndication to television stations across the United States. In 1988, the Christian Science Monitor Reports won a Peabody Award for a series of reports on Islamic fundamentalism. That same year, the program was canceled and the Monitor created a daily television program, World Monitor, anchored by former NBC correspondent John Hart, which was initially shown on the Discovery Channel. In 1991, World Monitor moved to the Monitor Channel, a 24-hour news and information channel. The channel launched on May 1, 1991 with programming from its Boston TV station. The only religious programming on the channel was a five-minute Christian Science program early each morning. In 1992, after eleven months on the air, the service was shut down amid huge financial losses. Programming from the Monitor Channel was also carried nationally via the WWOR EMI Service (a nationally oriented feed of New Jersey TV station WWOR-TV, launched in 1990 due to the SyndEx laws put into place the year prior). The print edition continued to struggle for readership, and, in 2004, faced a renewed mandate from the church to earn a profit. Subsequently, the Monitor began relying more on the Internet as an integral part of its business model. The Monitor was one of the first newspapers to put its text online in 1996, and was also one of the first to launch a PDF edition in 2001. It was also an early pioneer of RSS feeds. In 2005, Richard Bergenheim, a Christian Science practitioner, was named the new editor. Shortly before his death in 2008, Bergenheim was replaced by a veteran Boston Globe editor and former Monitor reporter John Yemma. In October 2008, citing net losses of $US18.9 million per year versus $US12.5 million in annual revenue, the Monitor announced that it would cease printing daily and instead print weekly editions starting in April 2009. The last daily print edition was published on March 27, 2009. The weekly magazine follows on from the Monitor's London edition, also a weekly, launched in 1960 and the weekly World Edition which replaced the London edition in 1974. Mark Sappenfield became the editor in March 2017. 1950, Pulitzer Prize for International Reporting: Edmund Stevens, for his series of 43 articles written over a three-year residence in Moscow entitled, "This Is Russia Uncensored". 1967, Pulitzer Prize for International Reporting: R. John Hughes, For his thorough reporting of Indonesia's attempted Transition to the New Order in 1965 and the purge that followed in 1965–66. 1968, Pulitzer Prize for National Reporting: Howard James, for his series of articles, Crisis in the Courts. 1969, Pulitzer Prize for National Reporting: Robert Cahn, for his inquiry into the future of the United States' national parks and the methods that may help to preserve them. 1978, Pulitzer Prize Special Citations and Awards, Journalism: Richard Strout, for distinguished commentary from Washington over many years as staff correspondent for The Christian Science Monitor and contributor to The New Republic. 1996, Pulitzer Prize for International Reporting: David Rohde, for his persistent on-site reporting of the slaughter of thousands of Bosnian Muslims in the Srebrenica Genocide. ^ Barnett, Jim (April 27, 2010). "What advocacy nonprofits can learn from The Christian Science Monitor". Nieman Lab. Harvard College. Archived from the original on October 6, 2017. Retrieved November 19, 2017. ^ Kasuya, Jacquelyn (April 30, 2010). "Nonprofit Christian Science Monitor Seeks New Financial Model". The Chronicle of Philanthropy. Archived from the original on December 1, 2017. Retrieved November 19, 2017. ^ Koestler-Grack, Rachel (2013). Mary Baker Eddy. New York, N.Y.: Chelsea House. ISBN 978-1-43-814707-9. ^ a b c d "About the Monitor". The Christian Science Monitor. Retrieved February 5, 2007. ^ Alex Beam (June 9, 2005). "Appealing to a higher authority". The Boston Globe. Archived from the original on September 8, 2008. Retrieved May 14, 2009. ^ Daniel Akst (Fall 2005). "Nonprofit Journalism: Removing the Pressure of the Bottom Line". Carnegie Reporter. Carnegie Corporation of New York. Archived from the original on March 11, 2015. Retrieved January 10, 2016. ^ Richard Curtiss (December 1997). "As U.S. Media Ownership Shrinks, Who Covers Islam?". Washington Report on Middle East Affairs. Archived from the original on April 27, 2013. Retrieved January 30, 2013. ^ "Carroll Reunites with family". CNN World. April 2, 2006. Archived from the original on September 12, 2013. Retrieved January 30, 2013. ^ Jill Carroll (August 14, 2006). "Hostage: The Jill Carroll Story". Christian Science Monitor. Retrieved January 30, 2013. ^  Archived September 10, 2013, at the Wayback Machine, Bloomberg Businessweek, October 28, 2008. ^ a b Bridge, Susan (1998). Monitoring the News. M.E. Sharpe. ISBN 0-7656-0315-2. ^ "Peabody Awards "Islam in Turmoil"". Archived from the original on June 11, 2010. Retrieved April 10, 2009. ^ "Monitoring the 'Monitor'" (PDF). Broadcasting. 119 (27): 64. December 31, 1990. Retrieved April 6, 2017. ^ Faison, Seth, Jr. (April 6, 1992). "New Deadline for Monitor Channel". New York Times. p. D7. Archived from the original on April 2, 2017. Retrieved February 18, 2017. ^ Franklin, James L. (April 24, 1994). "Monitor Channel is missed". Boston Globe. p. 28. Archived from the original on October 25, 2012. ^ Gill, K. E (2005). "Blogging, RSS and the information landscape: A look at online news" (PDF). WWW 2005 Workshop on the Weblogging Ecosystem. Archived (PDF) from the original on October 20, 2012. Retrieved January 30, 2013. ^ Cook, David (June 9, 2008). "John Yemma named Monitor editor". The Christian Science Monitor. Archived from the original on May 3, 2009. Retrieved January 30, 2013. ^ Fine, Jon (October 28, 2008). "The Christian Science Monitor to Become a Weekly". Bloomberg BusinessWeek. Archived from the original on March 10, 2016. Retrieved January 31, 2013. ^ Clifford, Stephanie (October 28, 2008). "Christian Science Paper to End Daily Print Edition". The New York Times. p. B8. Archived from the original on April 17, 2009. Retrieved October 28, 2008. ^ "Monitor Timeline". The Christian Science Monitor. ^ Cook, David T. (December 16, 2013). "New editor named to lead The Christian Science Monitor". The Christian Science Monitor. Archived from the original on August 3, 2017. Retrieved August 2, 2017. ^ "The Pulitzer Prizes; 1950 winners". Pulitzer. Retrieved April 19, 2010. ^ "The Pulitzer Prizes; 1967 winners". Pulitzer. Retrieved April 19, 2010. ^ "The Pulitzer Prizes; 1968 winners". Pulitzer. May 26, 1967. Retrieved April 19, 2010. ^ "The Pulitzer Prizes; 1969 winners". Pulitzer. October 14, 1968. Retrieved April 19, 2010. ^ "The Pulitzer Prizes; 1978 winners". Pulitzer. October 20, 1977. Retrieved April 19, 2010. ^ "The Pulitzer Prizes; 1996 winners". Pulitzer. Retrieved April 19, 2010. ^ "The Pulitzer Prizes; Editorial cartooning – Citation". Pulitzer.org. Retrieved April 19, 2010. Conciatore, Jacqueline (April 28, 1997). "Christian Science Church puts Monitor Radio up for sale". Current. Archived from the original on October 11, 1997. Conciatore, Jacqueline (June 23, 1997). "Monitor Radio goes dark at end of this week". Archived from the original on October 11, 1997. This page was last edited on 2 April 2019, at 18:11 (UTC).